Wilfried Bony's first goal for Manchester City helped his side on their way to a much-needed victory after Gareth McAuley was controversially sent off for West Brom. Fernando and David Silva added further goals as City cut Chelsea's lead at the top of the table to three points, at least until Jose Mourinho's side play their two games in hand. But the game turned on McAuley's dismissal after just 89 seconds - the fastest in the Premier League this season - when it was unclear whether referee Neil Swarbrick had shown the red card to the wrong man. It was the second case of apparent mistaken identity in the Premier League in less than a month, following Wes Brown's red card at Old Trafford for a foul by his Sunderland team-mate John O'Shea. They still had to wait until the 27th minute to make the breakthrough against West Brom's 10 men, when the ball bounced kindly for Bony in the box and the £25m January signing calmly side-footed home. From then on, the result was never in question with West Brom concentrating on defending in numbers in front of their own area rather than trying to threaten at the other end. The Baggies' resistance was broken again five minutes before the break, when some disastrous defending from a corner allowed Fernando to pounce and score City's 1,000th Premier League goal. In total, Manuel Pellegrini's side mustered 26 shots in the first 45 minutes, the most in a top-flight game since 2003-04. Such was their dominance, they were also enjoying upwards of 80% of possession and only wayward shooting and the excellence of West Brom keeper Boaz Myhill kept the score down after half-time. Sergio Aguero sent a shot thudding against the post and Bony hit the bar with his follow-up as the hosts continued to attack. West Brom did briefly threaten at the other end, with Saido Berahino heading against the woodwork from close range before former City defender Joleon Lescott followed up to nod over. But City had the last word when substitute Stevan Jovetic let fly and Silva was in the right place to turn the ball home. Match ends, Manchester City 3, West Bromwich Albion 0. Second Half ends, Manchester City 3, West Bromwich Albion 0. Offside, West Bromwich Albion. Darren Fletcher tries a through ball, but James Morrison is caught offside. Attempt missed. Edin Dzeko (Manchester City) left footed shot from outside the box is close, but misses to the left. Assisted by Jesús Navas. Substitution, West Bromwich Albion. Youssuf Mulumbu replaces Stéphane Sessegnon. Jonas Olsson (West Bromwich Albion) wins a free kick in the defensive half. Corner, Manchester City. Conceded by Craig Dawson. Stevan Jovetic (Manchester City) wins a free kick in the defensive half. Substitution, West Bromwich Albion. Victor Anichebe replaces Saido Berahino. Corner, Manchester City. Conceded by Chris Baird. Substitution, Manchester City. Edin Dzeko replaces Wilfried Bony. Goal! Manchester City 3, West Bromwich Albion 0. David Silva (Manchester City) left footed shot from very close range to the bottom left corner. Assisted by Stevan Jovetic following a corner. Attempt missed. Stevan Jovetic (Manchester City) right footed shot from the centre of the box is close, but misses to the left. Assisted by Gaël Clichy following a corner. Offside, West Bromwich Albion. Craig Gardner tries a through ball, but Jonas Olsson is caught offside. Craig Gardner (West Bromwich Albion) wins a free kick in the attacking half. Attempt missed. Wilfried Bony (Manchester City) right footed shot from outside the box misses to the left. Assisted by Sergio Agüero. Attempt missed. Joleon Lescott (West Bromwich Albion) header from very close range is too high. Assisted by Saido Berahino with a headed pass following a corner. Saido Berahino (West Bromwich Albion) hits the bar with a header from very close range. Assisted by Jonas Olsson following a corner. Attempt missed. Jonas Olsson (West Bromwich Albion) header from very close range is close, but misses to the left. Assisted by Craig Gardner with a cross following a corner. Corner, West Bromwich Albion. Conceded by Gaël Clichy. Attempt missed. Stevan Jovetic (Manchester City) right footed shot from outside the box is close, but misses to the right. Assisted by David Silva. Corner, West Bromwich Albion. Conceded by Pablo Zabaleta. Substitution, Manchester City. Stevan Jovetic replaces Frank Lampard. Joleon Lescott (West Bromwich Albion) wins a free kick in the defensive half. Attempt missed. 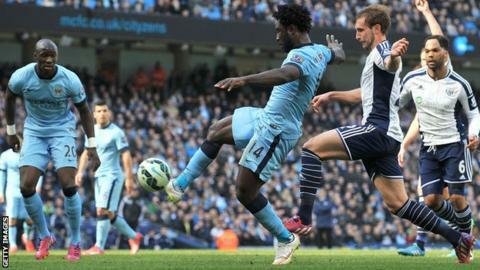 Wilfried Bony (Manchester City) header from the centre of the box misses to the right. Assisted by Pablo Zabaleta with a cross following a corner. Corner, Manchester City. Conceded by Boaz Myhill. Attempt saved. Jesús Navas (Manchester City) right footed shot from the right side of the box is saved in the bottom right corner. Assisted by Fernando. Attempt blocked. David Silva (Manchester City) left footed shot from the left side of the box is blocked. Assisted by Frank Lampard.